Feels good to be here once again. Yes I have a week off so managed some time in the Craft Room. I made a quick and easy tag with this fab image from Aall & Create. I very much enjoyed my usual visit to Ally Pally on Sunday and just had to buy this stamp set, just love it. I began by stamping out the image with Versafine Black Onyx. I stamped her again onto a piece of masking paper. Cover her with the masking paper and blend over the card with Distress Inks in Stormy Sky, Antique Linen and Spun Sugar. I used a stamp from a Stamping up set to create the water. 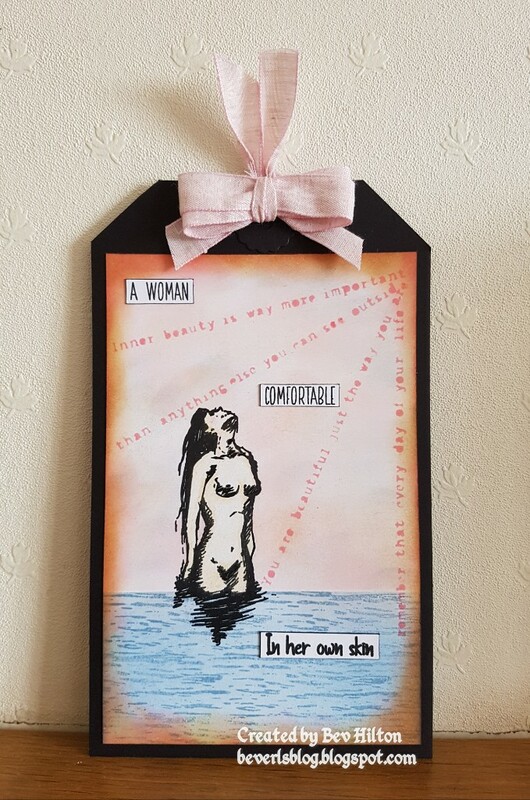 I used a stencil by Aall & Create and Distress Ink in Worn Lipstick to create the wording by masking out the lines of words to pick out the wording I wanted to use. Remove the mask and colour the image with pencils softly. Stamp the verse from the stamp set in black Versafine ink and cut out the words I wanted to use, run a black brush pen around the edges and glued on to the card. Blend around the edge of the card with Vintage Photo and Worn Lipstick. I mounted my card straight onto a piece of Black Card, cut off the top corners and punched a hole for the ribbon. I used a very soft pink ribbon from my stash. Hope you like it and as always thanks for stopping by. Card was created with weathered wood and antique linen. The camera was stamped with black versafine on a spare piece of card and embossed. Cut out and put aside. Stamp the photo film several times and cut out. Stamp three in a row. Mask off to stamp the face in each one. Stamp the bird again directly onto the card. Colour with any colour of choice. Glue all the pieces onto the card. Blend the weathered wood around the edge of the card. Take the lines from the PaperArtsy set and stamp around the edge of the card randomly using Archival watering can. Mount onto black card and again onto coordinating card before mounting onto white card base. Take a piece of white card, I chose to die cut my card using a stitch die. I believe this is one of Sue Wilson's. 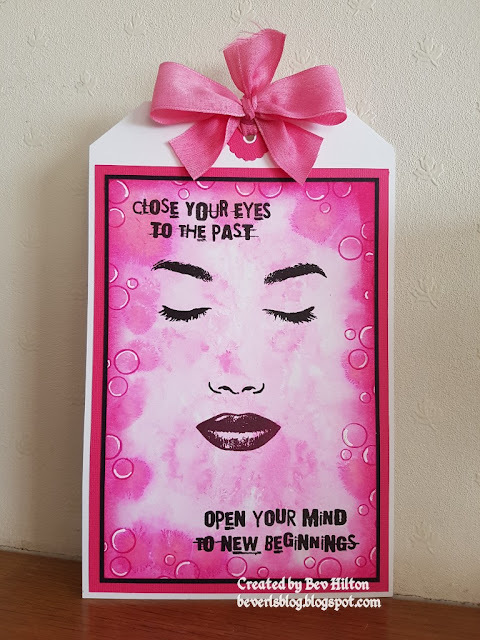 Take the stencil and place down onto the card and use low tack masking tape to hold in place. Gently blend over the stencil with the Antique Linen using a brush until you have the desired depth of colour. Remove the stencil carefully. 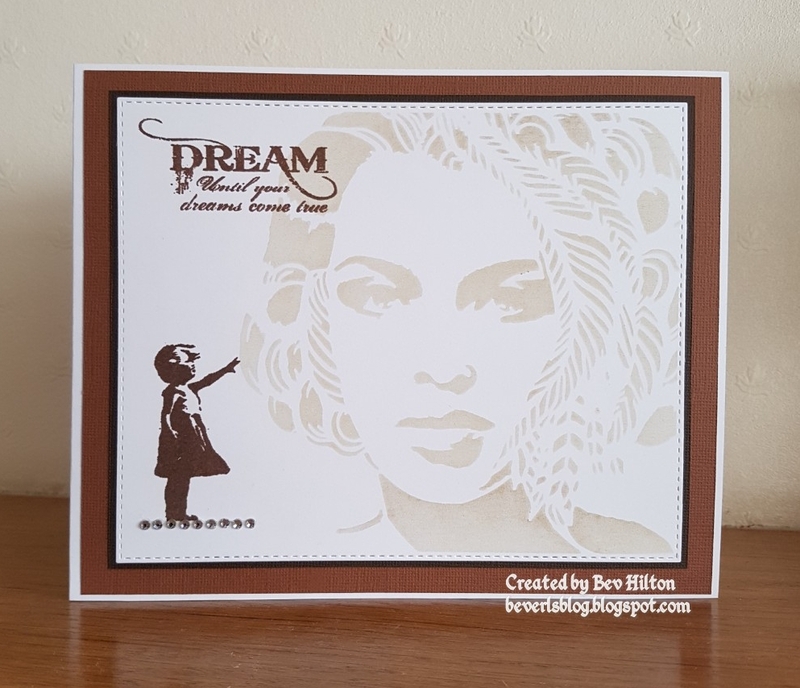 Take the stamp of the girl and ink up using the Vintage Sepia. Stamp onto the card. I used a stamp platform to allow a repeat stamp to get full coverage and the depth of colour I wanted. 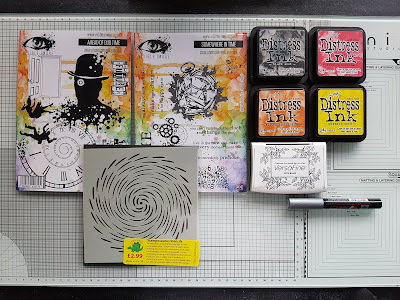 Take the wording from the Inkylicious stamp set and ink up using the same ink and stamp in place. To ground the girl I simply used a string of small gems. Mount onto dark brown card stock and again onto coordinating colour card. Mount onto your white card base. Well here I am again. I am really enjoying this week I have to say, although not much house work is getting done sadly. I am back again with another make using Visible Image. Just love their stamps. I have already made a similar one to this way back but this one kind of just happened. Well it's all good fun. I have taken a photo of items used to save time listing. I began with a piece of mixed media card. It needs to be able to take a lot of water. Spritz the card heavily with water so that there is plenty sitting on top of the card. Take a paint brush and dip into the Ink. I used Crimson and Purple. Drop and dab the ink onto the card so that it spreads out into the water. It will do its own thing. Lay a piece of paper towel down onto the card to soak up most of the water. Repeat if you feel the need until the colour is as you want it. Dry well with a heat tool. Take the Versafine ink and ink up the closed eyes and stamp down onto the card. As always I used a stamp platform for this to allow repeat stamping to get the depth of colour and a solid image. Take the nose and lips and carefully ink up the nose with the black and stamp down. Now ink up the lips with the plum archival ink and stamp down onto the card. Take the words stamp and ink up with the black versafine ink. I wanted to separate the words. To do this, mask off the bottom two lines while you ink the stamp, then remove the masking tape and stamp down. Repeat this process to enable you to stamp the bottom two lines at the bottom of the tag. Blend around the outside of the tag with the distress ink to darken the edges. 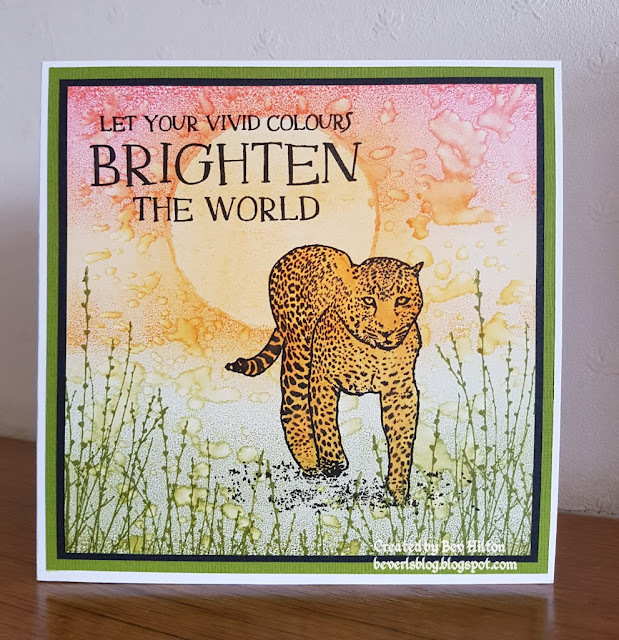 Once happy with the colour, take the circles stamp from the Ripple Effect stamp set and stamp down using the Magenta Hue archival ink pad. Do this all around the outside of the tag. Take the white posca pen and gently line the inside of all the circles partially just to add highlights. Mount onto a piece of black card and then onto coordinating card before mounting onto a piece of white card. Snip off the corners to create the tag. Punch a hole for the ribbon. I took a piece of white ribbon and coloured it with the distress ink to create a matching ribbon. Visible Image stamp... Your Vivid Colours. Archival Ink Pad... Fern Green. Distress Inks... Peeled Paint, Shabby Shutters, Spiced Marmalade and Abandoned Coral. Make a print using the gel press. Mask off the sun before applying the inks listed. Remove the mask and brush over lightly with the spiced marmalade until happy with the depth of colour. Take the leopard and ink up with the black ink. This stamp is open so I like to give it an outline. Do this with a fine liner unless you prefer the stamp left as is. Take the willow twig and ink up with the fern green and stamp across the bottom of the card. Take the words and stamp at the top of the card using black ink. Mount onto black card and again onto a piece of coordinating card. Finish by mounting onto your card base. I am back again. What a fab week I am having. Must say it has flown by way too quick but then it does when you are having fun. I hope you have all had a good week and maybe got a little crafting done too. Well I have changed up the mix a bit and gone back to a card for a change. Stampers Anonymous... Tim Holtz Sea Life. Visible Image stamp set... Dare to Swim. Stampin Up stamp set... High Tide. Versafine Ink pad... Onyx Black, Vintage Sepia and Spanish Moss. 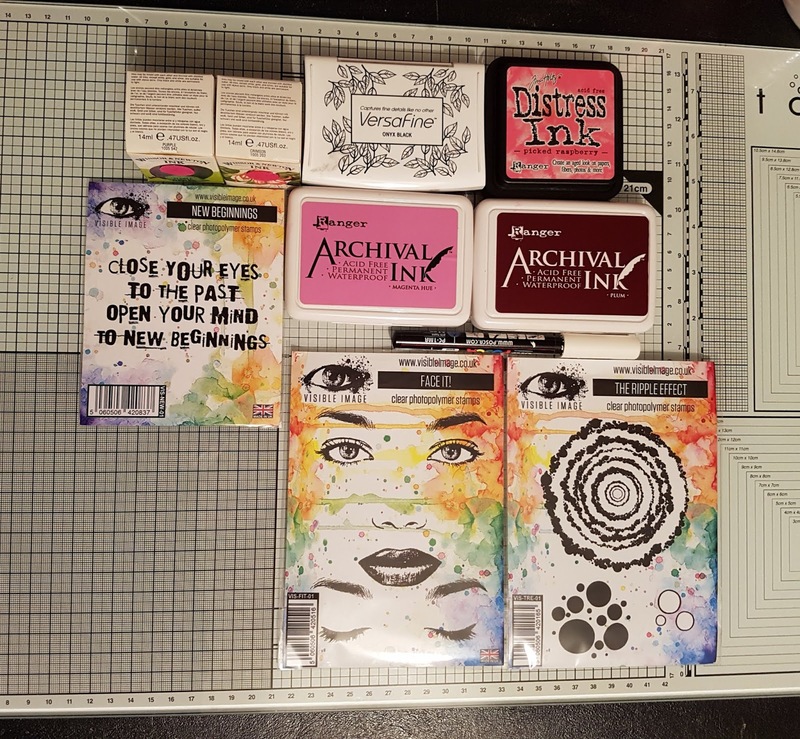 Distress ink pads... Peacock Feathers, Mermaid Lagoon, Mustard Seed and Wild Honey. 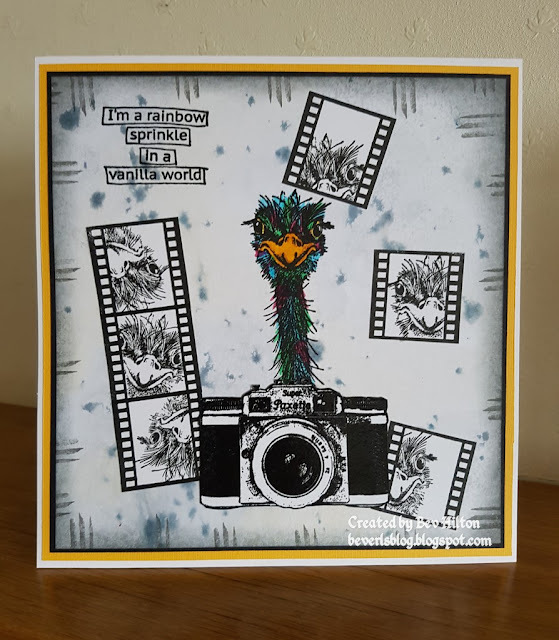 Create your back ground using the gel press and distress inks. I use one of my embossing plates to attach the gel press so I can press in down exactly where I want it just like you would with a stamp. Take the octopus and ink up with the black versafine ink and stamp down. Repeat stamp until happy with the image and depth of colour. I used a foliage stamp to the left of the card, I am not sure who the stamp is by as it is very old and no packaging but any would do. I stamped this with the versafine spanish moss. To make sure I kept within the circle I made a mask from a spare piece of card. 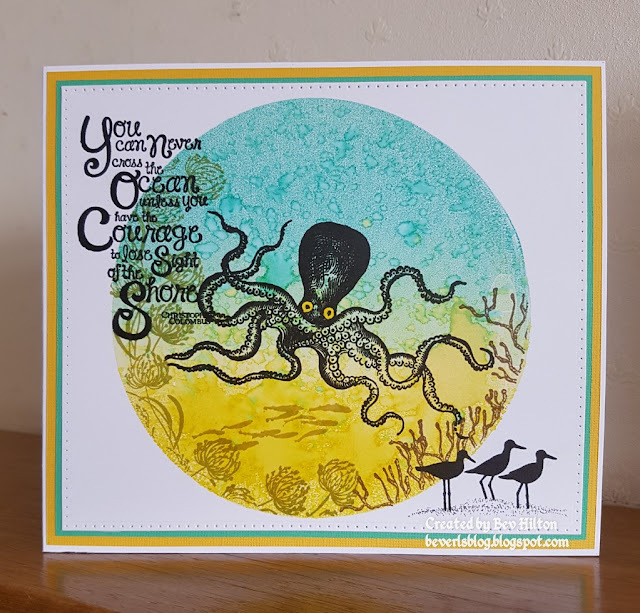 I did the same to the right of the card with the foliage stamp from the same set as the octopus using the versafine vintage sepia. Now take the fish from the visible image stamp set, and using the versfine spanish moss, ink up and stamp down just below then octopus. Now take the wording. Again I don't know the make as there is no packaging and I have had the set a long time. You can choose any appropriate verse for this. Stamp using versafine black ink to the top left. I used the birds from the stamping up set, again using black versafine and stamped these bottom right. I used the dots pen to ground the birds. If you don't have one then you can ground the birds any way you choose for the same effect. I chose to die cut my card with a stitch die. Mount this onto colour coordinating card and then mount onto your white card base. I decided I wanted the eyes to stand out a little more so used a yellow posca pen to do this. A nice easy card to make but quite effective. I hope you like it and even better, maybe got inspired. 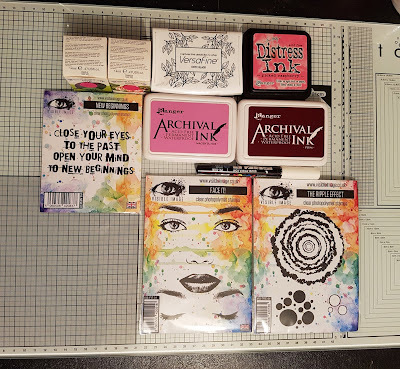 I have saved time listing again with a photo below of items used to make this tag. I began with a piece of mixed media card and blended over the whole tag with Mustard Seed distress ink. Take the stencil and place on the tag to the top right and blend through with Festive Berries distress ink. Do the same again with the stencil placed at the bottom left. Take the same ink and blend around the edge of the tag. 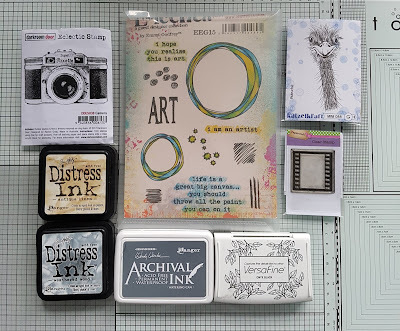 Take the fab swirly stamp from the first stamp set called Ahead of our Time and ink up with the versafine ink. Repeat stamp if needed to get a good dark image. Take the birds and stamp at the top right. Take the words from the second stamp set called Somewhere in Time and stamp these using the versafine ink pad. To create the the edges of the tag I used the sides of the large splat stamp. Ink up the sides of the stamp and stamp all the way round the tag. Take the black soot distress ink and blend lightly round the edge of the tag. I wanted to grunge it up a little so took a blending sponge and very lightly blobbed it over the yellow to dull it down a little. Mount onto black card and again onto a piece of coordination card and then mount onto the tag base. 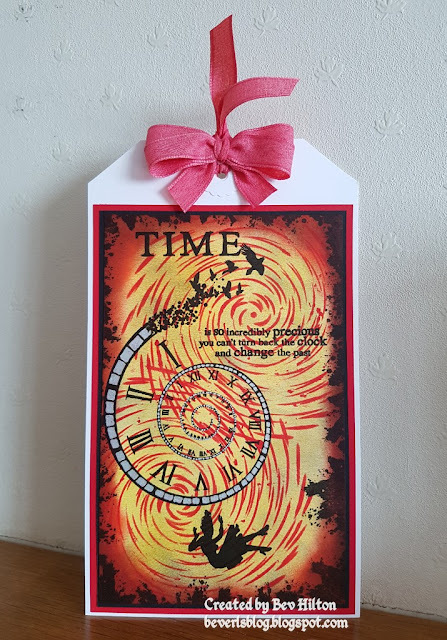 As always I used a piece of plain ribbon and coloured it with the festive berries distress ink to make a matching ribbon. As always, thanks for dropping in.